The ministry of railways' decision to bar consumers from using e-wallet and cash cards to book train tickets using the Indian Railways Catering & Tourism Corporation Ltd, or IRCTC, website for four hours daily could affect Paytm and Mobikwik's plans to get train travellers to use their mobile wallets. The two mobile wallets have turned out to be popular with customers as they offer various discounts such as up to 100 per cent cashbacks on convenience fee charged for booking train tickets at IRCTC in exchange for paying through their respective wallets. Queries sent to Paytm and Mobikwik by Techcircle.in on the impact of the IRCTC order did not elicit any response till the time of filing this report. IRCTC itself had launched an e-wallet in November 2013. In the first four months after its launch, only 32,000 users had registered for it. The railway ministry on Thursday announced new rules for booking of online tickets through the IRCTC website, which will be effective from February 15. It has barred usage of e-wallets and cash cards between 8 am and 12 noon, besides reducing the maximum number of ticket bookings allowed to an individual user to six in a month from the current 10. Only last month Gurgaon-based One MobiKwik Systems Pvt Ltd, which runs Mobikwik, had said that it expects to facilitate railway ticket bookings worth Rs 1.75 crore in the next six months. Indian Railways had chosen Mobikwik as its primary wallet for IRCTC Connect Android App. Paytm, run by One97 Communications Ltd, has over 100 million subscribers for its mobile wallet. "This has been done keeping in view the analysis of usage of quota of 10 tickets which indicated that 90 per cent of users are booking up to six tickets in a given month and only 10 per cent are making more than six tickets. It is suspected that the 10 per cent users might be involved in touting activities. Therefore, to deter such touts and to facilitate genuine users, it has been decided that a maximum of six tickets can be booked by an individual user in a month," said a press statement issued by the ministry. The IRCTC has also said user will be allowed to book only two tickets for advance reservation from 8 am to 10 am per user ID in a day. 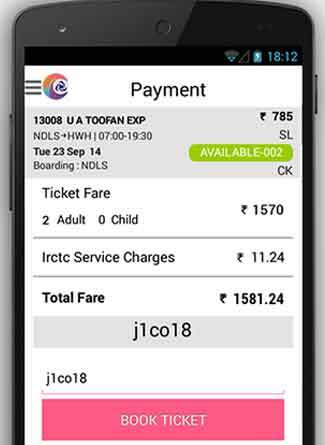 It also bars users from booking more than two Tatkal tickets per user in a day from 10 am to 12 noon. IRCTC has also decided to disable the quick book option. It has also barred all types of ticketing agents from booking tickets from 8 am to 8:30 am for general bookings and from 10 am to 10:30 am and 11 am to 11:30 am for Tatkal booking in AC and non-AC classes. It also restricts users from booking more than one ticket in one user login session except for return/onward journey between 8 am and 12 noon. Half of the Indians who travelled by train last fiscal year booked their seats via IRCTC. In fact, the number of e-tickets booked have almost doubled over the past five years while the total money paid in fare jumped two-and-a-half times to cross Rs 20,500 crore.